What an exciting day I had today! First I learned that I won some blog candy from Carrie's Blog Stamps, scraps and Scissors. How exciting, thank you so much Carrie! Be sure to stop on by Carrie's blog, she does lovely work and she has one of my favorite blogs! Her blog can be found here! Then last night I received a phone call from my local AC Moore store to let me know that I had won a fall flower arrangement. When I was there yesterday my husband filled out a drawing form for me and this is a picture of the arrangement I won. (I went to pick it up this morning). It's a lot prettier in person and I'm excited to have won! I have another Halloween card that I wanted to post today. This is a really easy card. I decided that my pattern paper would be the inspiration for the colors I used. I used my Batty for You SU stamp set and I picked three images that I felt the colors would work best with my pattern paper. I used orange for the pumpkin, black for the spider image, and green for the ghost. I simply stamped my images and then I punched them using my circle punches. For those of you who aren't aware of this, it is much easier to stamp your images first and then punch them out. If you use your punches upside-down you will be able to see the image you are trying to punch. 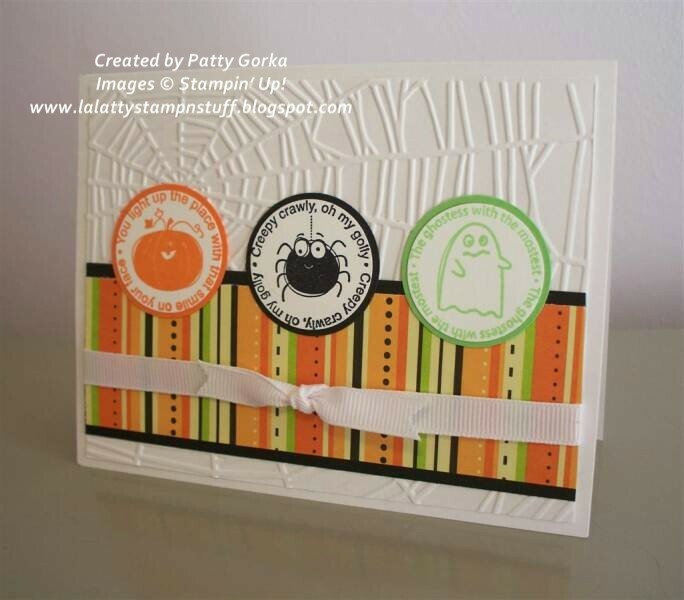 My background is embossed using my cuttlebug and Spiderweb embossing folder. I love this Halloween folder and I'm thinking it could make some really cute cards. My pattern paper is from the dollar spot at Target and my ribbon is from Offray. I was just at my local Target store and I didn't see any more scrapbooking items, I hope they get them back again soon! Thanks for stopping by and I hope you have a great rest of the day. I'm off to get moving today and get some house work done. 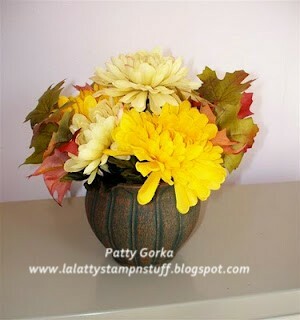 Patty, congrats on winning blog candy and flowers! And you know your card is so stinkin' cute I'll be casing you again! Cute card! I love the embossing in the top half and the colorful stripes in the lower half. With cute images in between! Cute Halloween card! Love all the white! Congrats on winning.Im so excited for you. What a cute card!I have that same DP.I Made a card using that same DP.I will be posting soon. such a cute halloween card, glad you had such an awesome day!! Congrats on your winnings. Lucky girl, you should have bought a lottery ticket. ;-) Love the Halloween card, it is adorable.